Tried out this carrot cake recipe given by a good friend of mine. Did not follow the recipe exactly but modified it to my requirements. My older boy really like to eat black fried carrot cake and he has been having this three days in a row for breakfast. 1. Mix all the water with the flour. 2. Heat some oil in a wok and fry chai por. Add in raddish and carrot and fry for a while. Add in about ¼ cup of water and fry until it gets dry. Mix rice flour solution well and pour into wok slowly. 3. Add some pepper, the salt and sugar. Mix well and cook until mixture starts to curdle up at medium heat. 4. Pour into a greased baking tin and smoothen with the back of a spoon. 5. Steam on high heat for 45 minutes immediately. 6. If there is water on the carrot cake after steaming, pour it away. Leave it to cool down totally before using it. 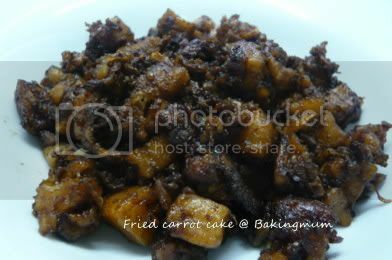 How to fry black carrot cake. 1. Cut the cool carrot cake into small pieces. 2. Add some oil in a wok, add some minced garlic and fry for a while. Add in carrot cake and fry until a bit brown. Add in some soaked chai por and fry some more. Beat two eggs in a bowl and add it into the carrot cake and let it set a little before stirring. Add in sweet black sauce and fry. If you like it more salty you can add some fish sauce when frying. Note: I like the black carrot cake a little wet, so I added some water after adding the sweet black sauce to fry until it has become softer and wetter. Before serving, you can sprinkle some chopped spring onion on top. I like to eat this on Breakfast...Very yummy!! You make the carrot cake youself. I usually buy from market and cook it myself. The taste not very nice. Could you pls share the recipe? Let me check with my girlfriend first. Would be grateful if you could share the recipe as this is my hubby's fav! Thanks! I just got permission from my friend to share her recipe. But I did some modification to the original recipe so give me some time to organise it before posting here. Thank you so much for putting up the recipe! "Add in about ¼ cup of ??? and fry until it gets dry. Mix rice flour solution well and pour into wok slowly." SUPER yummy Chai taw kueh! I reduced the water slightly and it still turns out SoOooOO good. Soft enough to be eaten as steam version yet firm enough for fried. FANTASTIC!!! An awesome 2-in one recipe. I can junk my other carrot cake recipe liao. Thank you for posting the carrot cake recipe. For Step 2, you mention add 1/4 cup of ?? and fry until it gets dry. May I ask what is it? Sorry I missed out the 1/4 cup of water there. I will amend my recipe accordingly. Thanks for pointing it out to me. Amy, if you want to eat it as a steamed version, you can also add in mushrooms and hae bee. Thanks, Lee for your suggestion, ur recipe is great enough to be eaten plain. I added 1 tsp of chicken powder though. Hi Hugbear, can i check how much is the serving for your recipe? And also what is the size of the tin you use to steam this? Only me and hubby at home to eat the carrot cake and am afraid I make too much! I used a 10-inch round tray. It is a lot so you may just want to do 1/4 or 1/2 recipe. when shredding the raddish, there is a lot of juice that comes out. should i throw them away or add it for the cooking as well? Hi Rachel, you are supposed to squeeze dry the shredded raddish. 1 cup of water is it equal to 250gm water. 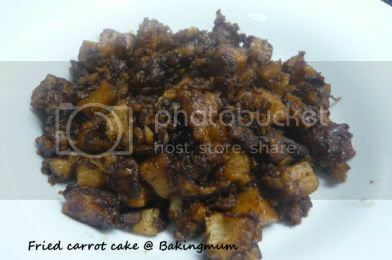 I follow your instruction to put 1.5 litre of water + 1 cup water + ½ cup water(one time to the flour) but aft frying the carrot cake it turn out into Crumble. Aft steam i let it cool down for 1 hour or I shd let it cool longer period. I let it cool overnight. 1 hour is not long enough for it to cool down totally. Greetings from California. I tried the chinese carrot cake recipe and son who lived in Singapore till he was 4 (and have carrot cake for breakfast almost every saturday) loved it. I used a stainless steel skillet to cook and the carrot cake seem to stick to the bottom of the pan no matter how much oil I use. Other than that, our family loved the carrot cake. If you have any suggestion on how not for the carrot cake to stick to the pan, I would love to learn it. Thanks a bunch. Hi Jojo, when I fry the carrot cake, I used a nonstick pan to fry. So for me there is no issue of it sticking to the pan. Greetings from Perth, just wondering whether you used the salted chai por or the sweet one? and did you use the one that has been cut into small pieces? Hi Noveny, I used the salty type, the chopped up into small pieces type. Soak it for a while before using so that it won't be so salty. I tweaked ur recipe by adding more radish. 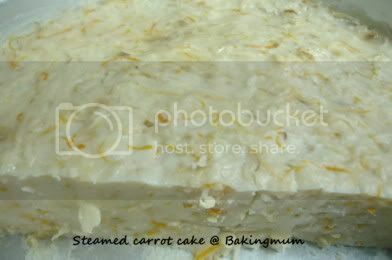 The result is a very firm carrot cake, no good for steam or fried. Safer to stick exactly to ur original recipe. Next, in the recipe, u state add in 1/4 cup water. This portion is additonal apart from 1.5L + 1 cup + 1/2 cup, right? Carrot is the normal orangy carrot. The 1/4 cup is additional to the water called for in the recipe. The carrot can be kept for about a week in the fridge. can i use rice flour and potato flour (50/50%). When i tried with rice flour only it turned out to be hard. If i want i the cake to have silky texture, should i mix? Hi Mtminoo, I am not too sure how it will turn out. If you don't want it too hard, add more water. To alter the texture, I don't think you should use 50%/50% of both flours. Maybe the ratio of rice flour should still be more than the potato flour or corn flour. Maybe 70/30. Just made this last night..for a family of 4. LOL....I have waaaay too much leftover so it's sitting in the freezer. But it was DELISH! Thanks for the recipe. I linked you to my post on Fried Carrot Cake. Thanks a lot..from USA. Hi 150gm radish like so little, can we use 300gm .of course plus the 100gm orange carrot. the radish i bought is 500gm. THks.